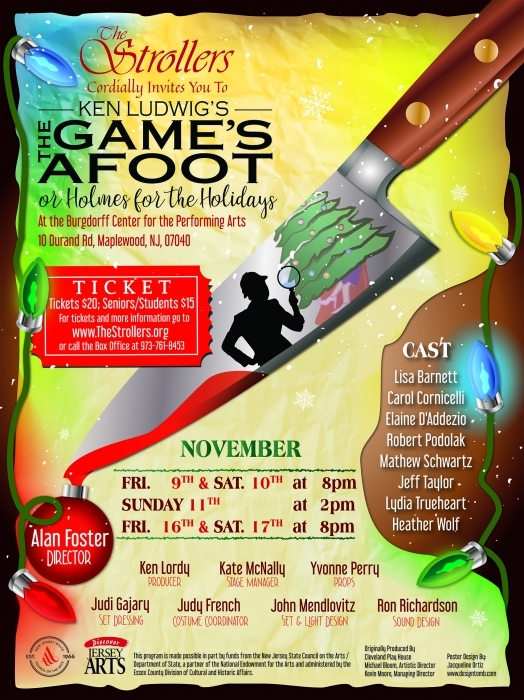 This holiday-centric comedy-meets-whodunit is set in 1936 and centers around William Gillette, a Broadway star known for his portrayal of Sherlock Holmes. When a murderer strikes during the Christmas holidays, Gillette must assume the real-life role of super-sleuth and crack the case. Burgdorff Center for the Performing Arts, 10 Durand Road, Maplewood. Fri and Sat 8pm, Sun 2pm. Tickets $20 (students/seniors $15), 973-761-8453 or www.TheStrollers.org.